To illustrate how containerisation is affecting globalisation the BBC is running an excellent little series called "The Box". 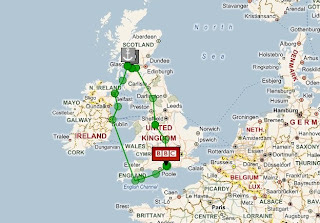 They have fitted a shipping container with a GPS unit and are following its journey around the world for a year. This is the kind of series that only the BBC does, and it does them so well. The container started out in Southampton, went to Glasgow to be loaded with whisky, was put on a boat at Greenock and is currently off Ireland. There is a map site where you can follow its progress. They are also doing a series of short videos that you can download from the BBC website. 1 Reducing the cost of shipping. Without cheap shipping we would have much less globalisation. 2. Putting millions of dockers out of work. 3. Changing many of our great cities. Go to London and look at the abandoned docks around Canary Wharf. The Royal Docks are huge but could not handle large container ships and lost out to container docks further down river. I have one quibble with the BBC series. They have not provided any historical context by providing a contrast between shipping before the box [break bulk cargo handling] and shipping as it is now [containerisation]. Without that it is hard to understand just how significant an innovation the container has been. I hope they will provide this context later in the series. There have been three main phases in the port handling of cargo. Manual era - men swarmed aboard a ship and man handled the cargo ashore. Mechanised era - pallets, fork lift trucks and other mechanical handling equipment were introduced. Container era - apart from increasing productivity containerisation put an end to much of the thievery that use to go on when cargo was handled by hand. Costs were reduced and so were handling costs. Levinson, Marc. The Box How the Shipping Container Made the World Smaller and the World Economy Bigger. Princeton University Press, 2008.